Deb Mitchell's Emerald Faeries Garden Blog: SOUTHERN GIRLS CHALLENGE- VINTAGE! Another fortnight means another challenge and this week we would like to see your Vintage skills on your projects. The DT have come up with AWESOME projects this week for your inspiration so don't forget to leave them some love. Also 2 more fantastic sponsors this week so be sure to enter to be in to win some lush goodies. Check the rules before linking please, it helps make things easier when working out which prize draw each person needs to be in, also a reminder 1 entry per person only please. oh Deb.. i love this one! 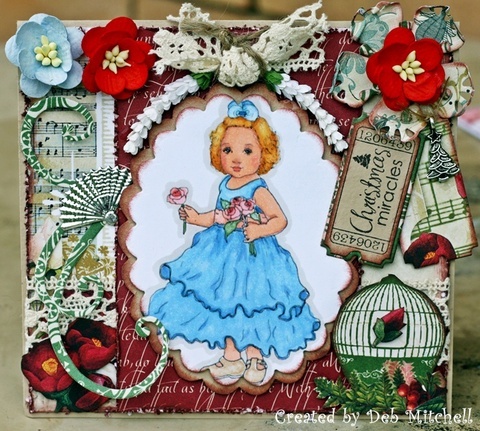 reminds me of when i was a little girl... i love the dress.. the embellies are stunning too.. i really LOVE your cards!! So much to look at!!!! Love it, very vintagy!!! Very cute Deb!! I love all the layers. I also love you blog background I though I clicked on mine for a minute, We just have great tastes. Your embellishing and colouring are great together, lovely cards!